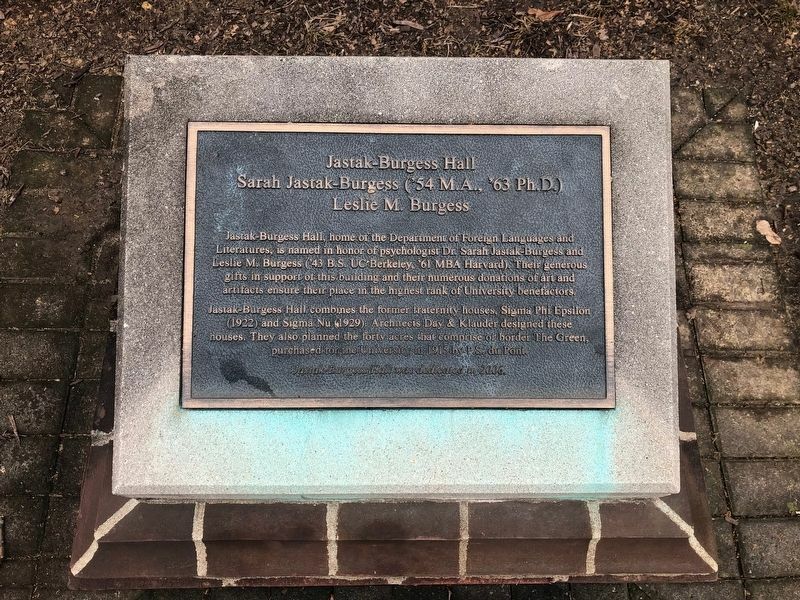 Jastak-Burgess Hall, home of the Department of Foreign Languages and Literatures, is named in honor of psychologist Dr. Sara Jastak-Burgess and Leslie M. Burgess ('43 B.S. UC Berkeley, '61 MBA Harvard). Their generous gifts in support of this building and their numerous donations of art and artifacts ensure their place in the highest rank of University benefactors. 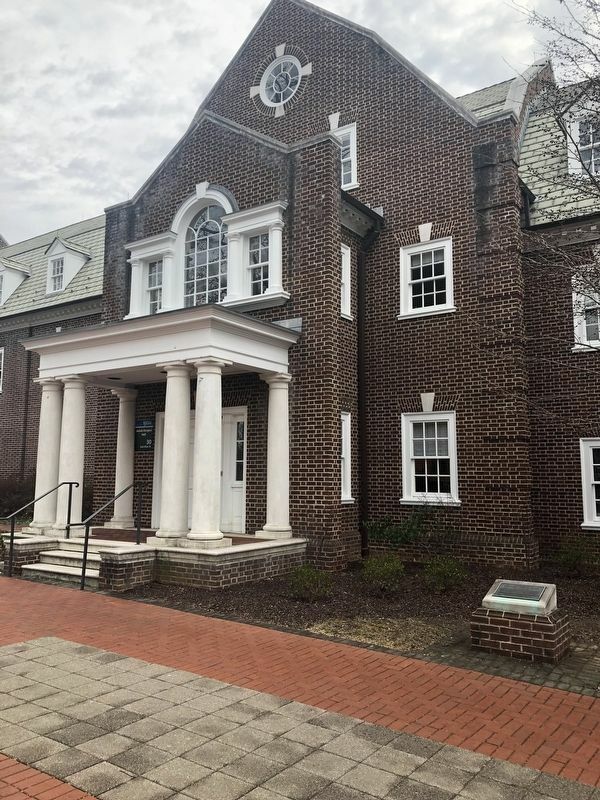 Jastak-Burgess Hall combines the former fraternity houses, Sigma Phi Epsilon (1922) and Sigma Nu (1929). Architects Day & Klauder deigned these houses. They also planned the forty acres that comprise or border The Green, purchased for the University in 1915, by P.S. du Pont. Jastak-Burgess Hall was dedicated in 2006. Location. 39° 41.018′ N, 75° 45.159′ W. Marker is in Newark, Delaware, in New Castle County. Marker can be reached from East Main Street east of North College Avenue, on the right when traveling west. Touch for map. Marker is in this post office area: Newark DE 19711, United States of America. Touch for directions. distance of this marker); Alumni Hall (within shouting distance of this marker); Recitation Hall Annex (within shouting distance of this marker); Recitation Hall (within shouting distance of this marker); Elliott Hall (about 300 feet away, measured in a direct line); Old College (about 300 feet away); The Diamonds Walkway (about 300 feet away); Harry Fletcher Brown (1867-1944) (about 300 feet away). Touch for a list and map of all markers in Newark. More. Search the internet for Jastak-Burgess Hall.